It’s been brought to my attention that the stronger you are in your convictions, the less attractive you are as a mate. Are men intimidated by me – by a successful woman? Granted, at least a quarter of my friends are bitter divorcees with mortgages (not ALL of them) but for the better part, many are happily married with children. The barrage of questions regarding my singledom is inevitable at public, private, and familial functions. “But you’re so pretty….you’re so smart…you’ve accomplished so much!” Trust me, I’ve heard it all and it’s getting VERY old. Just two days ago, sitting across from my brother and cousin, I realized we were the last several unmarried cousins of nearly two dozen. Newsflash! “Single is NOT a sickness. There is NOTHING wrong with me,” (courtesy a colleague, J. Brown). Double standard much? Or has the culture we’ve been raised in fostered this kind of self-loathing behavior among females? Coming from an all-girls private high school just outside the capital of the free world, I find this incredibly disturbing and just plain sad. What’s so ironic here is that these women are only “alone” because they are on business trips. If they are on said trips, they must be successful (i.e. they have careers, travel, expense accounts, etc.). 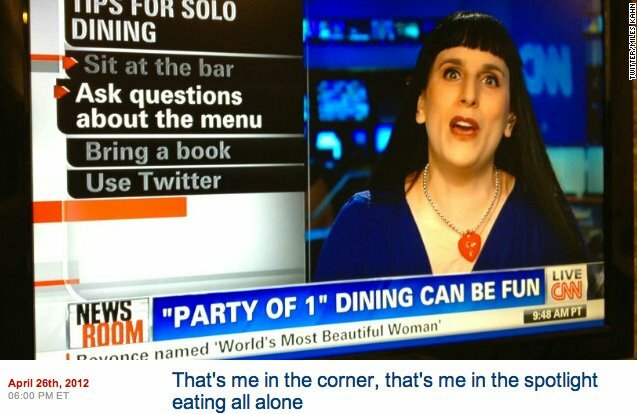 Given that, why are these women who confidently climbed the corporate ladder so terrified of alone time with a meal in front of them? AMEN! But I digress. While this post focuses on independent business women finding love, such as myself, it doesn’t necessarily have anything to do with eating alone. Six months came and went and with no successful unions to show for it, I called customer service and spoke with a representative. The male agent informed me – and I’m not kidding here – that it would behoove me to move if I wanted to find love (despite most of the places I’ve called “home” being listed as best cities for women’s well-being by a 2012 “Measure of America” report). His exact words were: “Men in those cities are just looking for the next best thing. 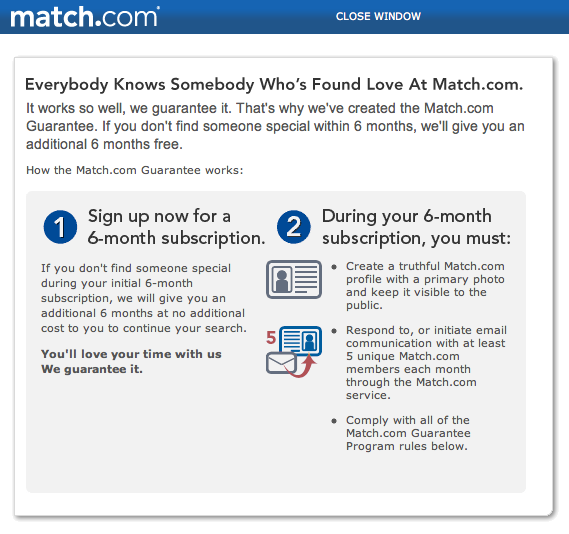 They’re never satisfied.” YES, a Match.com representative passed on that recommendation to a paying client. Despite having one close friend who found his wife on the site, every time one of their ads appears on TV, I laugh and yell “LIES!” at the screen. So what’s an attractive, smart, fun, worldly girl to do with information like this and similar reports noted by WTOP? I guess I’ll revel in the fun I had in my 20s and provide you with this golden nugget written for my alma mater’s newspaper, Emerson College’s “Berkeley Beacon.” The last gentleman mentioned is now married and has a son, and we’re still friends. The following link will take you to a digital PDF of the amusing piece. So WHAT IS LOVE? The tagline from Cameron Crowe’s 1992 “Singles” movie poster is “Love is a game. Easy to start. 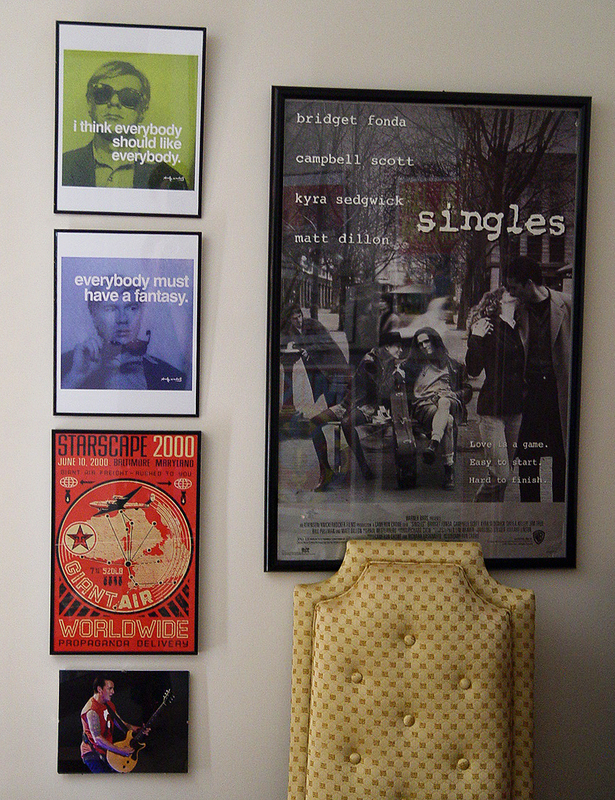 Hard to finish.” It’s one of my favorite films and is featured in the below image of one of my guest room walls. Those three simple sentences might entice potential viewers, but they leave me with little hope. Don’t get me wrong, I’m a team player, but I’ve never found much use for games in the realm of love. Maybe that’s my problem. I’m too straight forward…too honest. I refuse to change myself for anyone, but moving forward I have resolved to not let the minutiae of life – mainly men – determine my happiness. The majority of my life has been spent in academia, communications, music, the arts, volunteerism, and building a career for myself. What is meant to be will be, and I’m at peace with that for now. Why you might ask? Because the most important person you should love is yourself and I do. Update: Received a private message via this comment re: this article worth mentioning: “So I’ll tell you why you’re single. It’s because you don’t give men who are capable of appreciating you a chance.” After meeting this man and experiencing absolutely no chemistry or physical attraction, and being aggressively pursued, I asked just to be friends. Damned if you do, damned if you don’t!